Without dense atmospheres and large magnetic fields, airless bodies are exposed directly to the harsh space environment, including space plasmas, UV- and x-rays, micro-meteoroid impacts, and high energy charged particle radiation. In direct response to this energy, bodies react by emitting neutral and ion vapors, by altering the flow of the surrounding space plasma, and by creating high-energy secondary radiation. 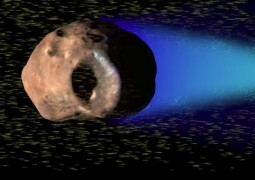 To understand the connection between the space environment’s coupled and dynamic interactions with exposed rocky bodies and human systems, SSERVI’s team called the Dynamic Response of the Environment at Asteroids, the Moons and moons of Mars (DREAM2) advances key science environmental themes that seamlessly intertwine into exploration applications. In this presentation, we illustrate the overlap between science and exploration, demonstrating that as our DREAM2 team members make fundamental science advances, they also are simultaneously deriving solutions to exploration-oriented strategic knowledge gaps. Our examples will include plasma-related differential charging of human systems on the Moon and asteroids, interaction of an outgassing spacecraft to a nearby small airless body, and allowable astronaut days in the space radiation environment. Dr. Farrell is a space plasma physicist at NASA/Goddard Space Flight Center with a research emphasis on the space environments at the planets, moons, and small bodies. He is a co-investigator on the Cassini mission to Saturn, a co-investigator on the Solar Probe Plus mission, and a lead instrument provider on the USAF/Demonstration & Science Experiments (DSX) mission. Since the early 1990’s, his instrument team has built numerous magnetic and electric radio-frequency elements to fly on rockets, balloons, remotely piloted vehicles, and spaceflight. In 2008, he was selected to be the PI of the DREAM center for the lunar environment and continues this work as lead of SSERVI’s DREAM2 team. He has authored/coauthored over 180 research papers in the area of space and planetary sciences.